There's this lil baby boy in NICU, born 4 months ago. He has a very nice and unique name. He's the cutest little button in the incubator. We have been seeing him every two weeks for retinopathy of prematurity (ROP) for the past 3 months , together with his twin sister. The lil girl has been discharged home a while ago, but the lil boy was still in the NICU. Last Wednesday I asked the staff nurse if he was ok, and the nice nurse said, "Yes Dr, but he is not due for ROP check up till next week." I didn't stop by to peep at him like I always do to my "old friends" in NICU. I was rushing to go to my physiotherapy. I thought I'll see him next week during my ROP round. Today I was informed that he had passed away this morning. And I cried during my clinic. I didn't get to see him again. 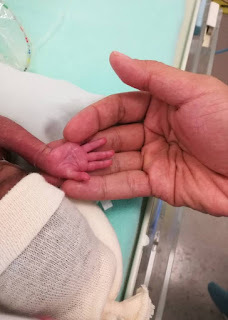 And and I know no matter how sad I feel, it's nothing compared to what the nurses in the NICU feel , after taking care of him for so long, or how devastating it must be for the parents. One twin in their arms, but they had to send one twin back to The Creator. May Allah give this family the strength they need at this difficult times. And may Allah give me strength to go through this challenging field , dealing with the super preemie. Malaskah Ummi kerana kita ada pembantu rumah?